Graphic novels and manga are not just for teens or anime fans. There are so many great stories and wonderful artists out there for you to discover, so why not try something new! Below are three popular manga series that could appeal to just about anyone. Bunny Drop is one of the most unique and unusual manga series I have ever encountered. It is a perfect choice for those wanting to give manga a try and haven’t read anything else or watching much anime before. It is in the slice-of-life genre, meaning that it portrays the real life of the characters, with no fantasy, science fiction, or supernatural content. Bunny Drop is the story of Rin Kaga, that little girl pictured on the cover, as she grows up with her adopted guardian, Daikichii. Rin is the daughter of a manga artist/author mother who abandoned her to Daikichii’s grandfather, who is the father! Daikichii does his best to raise Rin, while Rin unknowlingly makes Daikichii into a better person in her own way. Bunny Drop is unbelievably sweet and addicting. Get your copy from KCPL by going to the catalog here! I personally am not a fan of the original Alice in Wonderland or Alice Through the Looking Glass or even the classic animated “Alice in Wonderland” movie. There is something unnerving about it. Despite that, I absolutely loved Alice in the Country of Hearts by QuinRose. The main character is, of course, the one and only Alice Lidell. Alice is feisty, but she isn’t mean, and she stands up for herself and stands her ground when it comes to things she feels strongly about. The male characters are so varied and different, and their character designs are incredible detailed; they have so much depth as people. Readers will enjoy meeting and making friends with all of them! The plot is impeccable in its forward motion by using short yet captivating story arcs. The introduction of new characters is seamless and smooth. The author reveals secrets and mysteries slowly, but without too much teasing. It is all just so good. So go out and read it. Start with Alice in the Country of Hearts omnibus volume 1, then move on to volume 2. Then move on to Alice in the Country of Clover. And then finally on to Alice in the Country of Joker. There are volumes for each of Alice’s possible suitors, so you’ll get to explore the possibilities of each story arc and relationship. I just discovered Blood Lad, and I loved it so much that I bought the first volume for my personal collection. It is so original, yet so familiar to many manga and anime fans. There’s a demon world, a human ghost, vampires and werewolves, monstrous creatures, and damsels in distress. The protagonist, Staz, is so loveable yet absolutely weird. He’s a demon, and a mafia boss, but he loves human culture, especially Japanese stuff, and he collects it like a hoarder. I really enjoyed the style of art that the author, Yuuki Kodama, has. There is a ton of detail, the characters’ expressions are awesome and full of feeling, and the character designs themselves are just very unique and appealing. Readers will love Staz’s crazy fashion sense, and wonder what strange outfit he’s going to toss his human ghost girl into next. Another great thing about the art are the color panels! There are several full color front and back pages in the front and middle of each volume. Each volume is simply enormous for a manga volume. It encompasses almost 3 normal sized manga volumes. There is so much content, so much story, so much cool art and quirky characters and awesome action and demon world shenanigans. 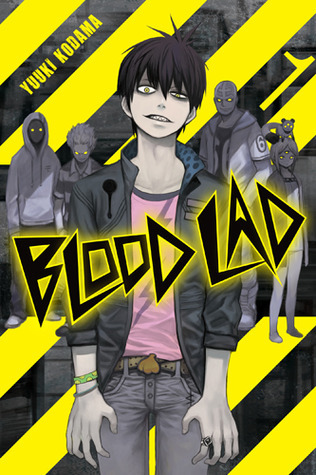 Right now there are 5 volumes of Blood Lad published in English. KCPL has the first 3 on order, and you can put them on hold by going to the catalog right here! This week’s entry was written by Eden Rassette, the Young Adult Programmer at Erlanger. You can see what she’s up to and what she is reading by following her blog: The Cosplaying Librarian.